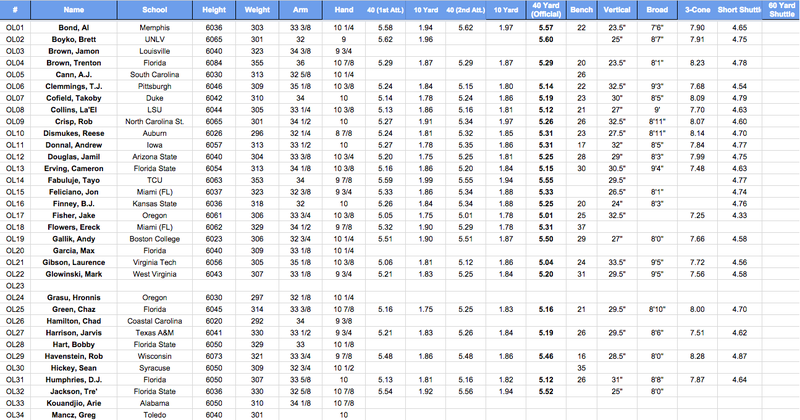 As I say every year, I enjoy watching the NFL Scouting Combine, but it is a very small piece of the evaluation process. 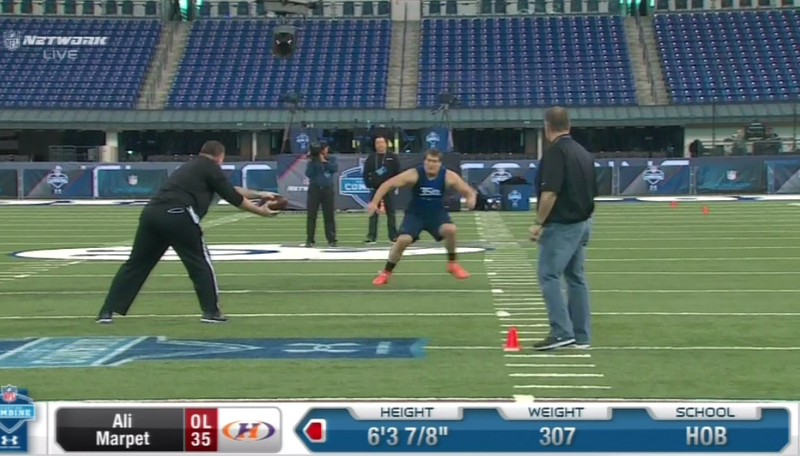 Smart analysts use the Combine to see if players’ measurables and performances in drills match what they saw on tape. If it doesn’t, then that’s a red flag and they have to go back and check what exactly they missed. Or to just see if the kid had a bad day. When I say that a player has “won” or “lost” at the NFL Combine, I’m referring solely to the fact that their good or bad performance could have made them some money or lost them some money with their performance. By and large though, there are more winners than losers. Guys who jump up on evaluator’s radars with great measurables and then it forces teams to go back and watch their tape more closely happens every year. The NFL Scouting Combine consists of 11 groups each holding certain positions that take the field for drills over the course of four days. Offensive linemen are split into groups one and two now, with the place kickers being ignored, at least when it comes to the on-field drills. Group three is the tight ends. Groups four and five consist of quarterbacks and wide receivers, and the running backs are in group six. Groups seven and eight consist of defensive linemen and group nine has the linebackers. Groups 10 and 11 hold the defensive backs. As of right now, the biggest takeaway I had from the first day is that this is a horrible TE class. Outside of about five players, I’ve been very unimpressed with this class, and one of the five didn’t even work out on Friday. It’s safe to say that I would be looking elsewhere to fill a tight end need, if I was a GM, if I didn’t get one of the top 3 players. The offensive linemen group has some pretty good players, but there’s not a player that is worth taking in the top 10, which isn’t the norm for this group. There are good players that will have an impact right away, but I do not see any top 10 franchise left tackles. There were quite a few offensive lineman that helped their cause, but many of them were already highly thought of. The only two that I would say have really made a major move up draft boards would be Jake Fisher and Ali Marpet. Fisher turned out to be a physical specimen and Marpet has continued to shoot up draft boards since he held his own at the Senior Bowl after playing at D-3 Hobart College. T.J. Clemmings, OL, Pitt: T.J. Clemmings looks like he will end up being the top tackle taken in the NFL Draft, purely because of his massive potential. Clemmings has only played offensive line for two years, but he has all of the physical tools to be successful. If you get him in the right situation, he can develop into a star because his measurables check all of the boxes. A 1.80 10-yard split with a 32.5″ vertical and a 9’3″ broad jump shows that he is extremely explosive. He may have only put up 22 reps on the bench, but that’s because he has some extremely long arms. La’El Collins, OL, LSU: A very powerful player who absolutely dominated the drills Friday, solidifying his spot in the top 40 of the draft. Collins looked very good moving in drills with smooth feet. He posted a 1.81 10-yard split with a 9′ broad jump and 27″ vertical and 21 reps on the bench. Another great part is he is extremely versatile and will be able to play LT, RT, or OG; a highly valuable trait. Cameron Erving, OL, FSU: Like Collins, he’s extremely versatile. He started games at tackle, guard and center in college and really found his niche at center. He’s probably one of the most athletic offensive linemen in this draft, posting a 1.84 10-yard split, 30 reps on the bench, a 30.5″ vertical, a 9’4″ broad jump…oh and did I mention he’s 6’5″ 313 lbs? He looked very smooth in drills and I think he will stick at center and make a team very happy. Personally, this is who I would love for the Lions to target. Jake Fisher, OL, Oregon: Perhaps the biggest winner of the day, as I said earlier, just because of the physical traits that he displayed. He weighed in at 6’6″ 306 lbs, then had a 1.75 10-yard split, 25 bench reps, and a 32.5″ vertical. That’s a very explosive athlete. It’s crucial for offensive linemen to have explosive/powerful lower bodies and Fisher has exactly that. His performance in drills wasn’t breath-taking, but he won the timing drills handily. D.J. Humphries, OL, Florida: Oddly enough, D.J. Humphries was told by the NFL Draft Evaluators to go back to school and now there is a chance he sneaks into the end of the first round. If that does happen, it’ll be pretty damning of the NFL’s “new system” that was put in place to try to keep younger kids who didn’t have a great shot to be drafted from declaring. Anyways, he is clearly giving the finger to the draft board throughout this process because he is rising fast. He did very well in the timing drills, posting a 1.81 10-yard split, 26 reps on the bench, a 31″ vertical and an 8’8″ broad jump. He won’t jump right in and start, which you can see from the video below he still has some work to do, but he has some major upside. Ali Marpet, OG, Hobart College: Marpet has come out of nowhere over the course of the last month. I personally hadn’t even heard of Hobart College until the Senior Bowl and he held his own quite well. He didn’t dominate everyone, but considering he played for a D-3 school, he was extremely impressive. Then the Combine comes around and he does well in the timing drills and now everyone is buzzing. A 1.74 10-yard split, with 30 reps on the bench, a 30.5″ vertical and a 9′ broad jump is quite impressive. He also looked very smooth in the drill in the video below. Andrus Peat, OT, Stanford: Peat measures up size-wise as a tackle, but I’m not a fan. He looked slow and out of shape during all of the drills. He was gasping for breath after every rep, and not because he was moving fast. He looked heavy-legged and like every movement was a major chore for him. His numbers were solid, especially given his size. A 1.82 10-yard split, 31″ vertical, 8’9″ broad jump at 6’6″ 313 lbs is very impressive. But, his performance in the drills was very disappointing. Brandon Scherff, OL, Iowa: Scherff unfortunately pulled up lame at the end of one of the first drills, but fortunately for him, he did well during all of the timing drills that he was able to participate in. Some people think that he still has some issues with pass protection, but if you slide him in at guard, he should be a plug-and-play guy from day one. Laken Tomlinson, OG, Duke: This is not an original comp., but Tomlinson is a dead ringer for Lions RG Larry Warford. He’s a mauler that’s built like a truck at 6’3″ 323 lbs. He then mixed in a 1.86 10-yard split, with 25 reps on the bench, a 31.5″ vertical and an 8’7″ broad jump. That’s an explosive guy for that kind of weight. He’s also got some pretty smooth movement in his feet and moves side-to-side quite well. Another name to watch is Mark Glowinski, a guard from West Virginia. He looked like one of the more explosive guards on the field on Friday during the timing drills. Nick O’Leary, TE, FSU: I may be a bit bias on this one but I love O’Leary. He’s like a slower version of Dallas Clark for me, a real old school tight end. He doesn’t wear any gloves and he catches the ball away from his body very well. He may have only ran a 4.93 40, but he can block and catch better than most. Not to mention he put 21 reps on the bench, a 30.5″ vertical and a 9’2″ broad jump. Aside from the 40, those are some good measurables. Clive Walford, TE, The U: At 6’4″ 251 lbs, he can move very well. He posted a 4.79 40, with 20 reps on the bench, a 30.5″ vertical and a 10′ broad jump. He may have trouble catching the ball consistently, but he’s got all the physical tools to be a mismatch at the next level. Maxx Williams, TE, Minnesota: Bar none the best tight end in this draft. 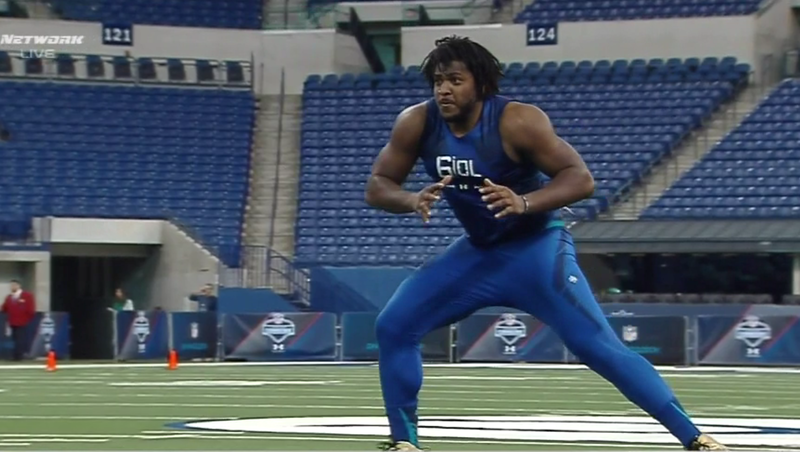 He’s only 6’3″ 249 lbs, but he’s got some solid athleticism. He damn near gave everyone a heart attack with a 4.90 40 the first time through, but his official ended up being a 4.78 with a 1.63 10-yard split, very explosive. Then he added 17 reps on the bench (not great), but a 34.5″ vertical and a 9’9″ broad jump. He may not have had a perfect day, but he did nothing to raise any concerns. Besides, when you can do stuff like this, or this, your measurables don’t matter that much. Just a note, the two blank spaces in the measurables are for players that declined invites. TE02 was Wisconsin TE Sam Arneson, who had to decline for health reasons. And OL23 was Texas A&M OL Garrett Gramling, who told the NFL that he no longer wants to play football. This entry was posted in NFL and tagged 2015 NFL Scouting Combine, Ali Marpet, Brandon Scherff, Clive Walford, D.J. Humphries, Jake Fisher, La'El Collins, Laken Tomlinson, Mark Glowinski, Maxx Williams, NFL Scouting Combine Day 1 Recap, Nick O'Leary, Offensive Linemen, T.J. Clemmings, Tight Ends. Bookmark the permalink.